Disclaimer: This post is sponsored by Delta, but all thoughts and opinions are my own. One of the things I love about the holidays is all the cooking and baking. It is so much fun to spend time in the kitchen especially when I can involve family and friends in the process. This is the perfect time of year to bring your kids into the kitchen to help. My kids love to help in the kitchen, but sometimes that can mean a mess. Or at least more of a mess than when I cook by myself. I don’t let this discourage me from letting them help though. The holidays is a time for making memories and I love bringing kids into the kitchen, even if it means more of a #HappiMess. Delta recently sent me a Delta Touch20 kitchen faucet to help make cleaning up messes a little easier. 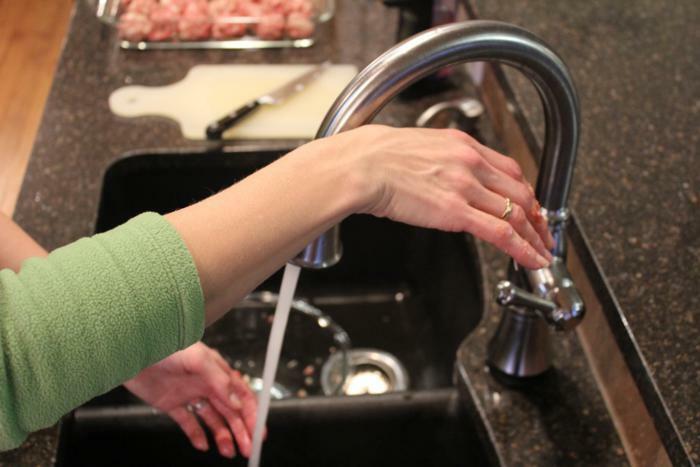 A new kitchen faucet was something I was thrilled to try out. Now, I will admit that my kids were as excited, if not more excited, than I was to try out this faucet. They had seen the ads for it and being kids they thought the whole idea was pretty neat. And I will admit I loved the idea of a faucet that you simply had to touch to turn on and off. My husband installed it recently and I have to say we love it so far. It is great for all those times that your hands are messy and you need to clean your hands or dishes up without making a bigger mess. 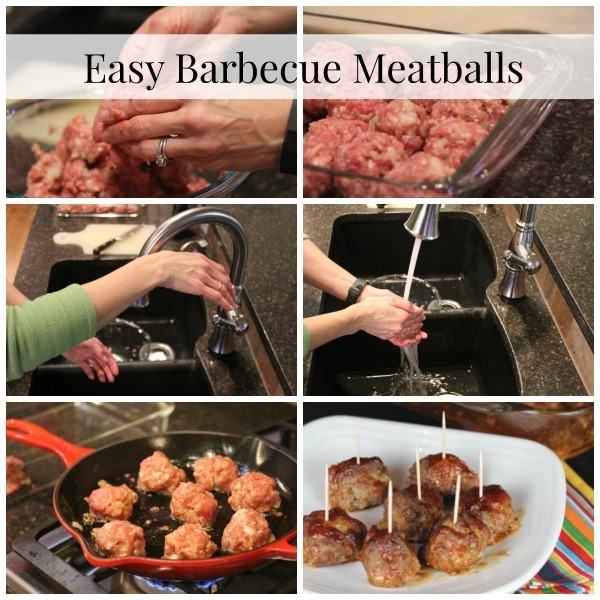 I made a simple bbq meatball recipe recently that was so much easier with the Delta Touch20 faucet. There is nothing quite like the mess in the kitchen when dealing with raw meat. 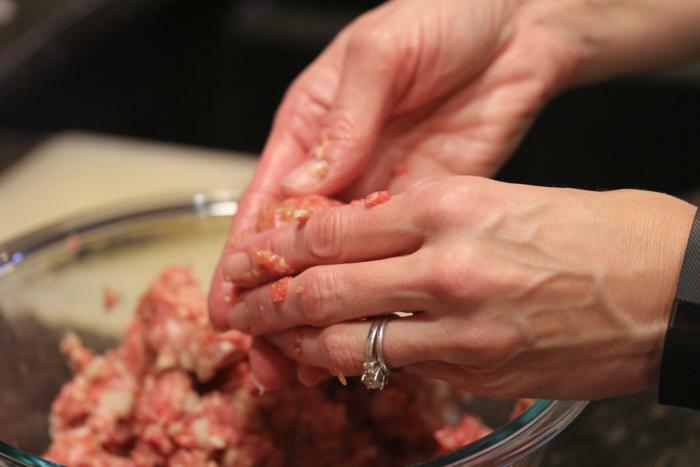 A meatball or meatloaf recipe where your hands get covered is even worse. It is hard to get clean without getting the raw meat from your hands everywhere. And raw meat everywhere is a bad idea. I loved the fact that with a simple touch to the faucet I could turn on and off the water. No more messy hands touching the handle. A simple tap anywhere on the faucet and I had instant water. I can’t wait to use this faucet when my hands are all doughy from holiday bread and cinnamon roll baking. Hands covered in bread dough can be almost as messy as meat. A simple touch and I will be able to clean up without dough getting everywhere. Now that we are #DeltaLiving cleanup will be so much easier. My kids, and my whole family, are fascinated with the modern technology and the fact that it is quick and easy to turn on the water. The meatballs I made recently were delicious! They are perfect for a holiday appetizer and are easy to make and I wanted to share them with you. Speaking of sharing, what’s the holiday #HappiMess at your house? Delta wants to know so please share on your social channels! You can serve these as the main part of a meal, but you can also make them a little smaller and serve them as an appetizer. Either way they are delicious! In a bowl combine all ingredients except bbq sauce. Form into meatballs about 1 to 1 1/2 inches in size. In a skillet brown meatballs. You may have to do this in several batches. 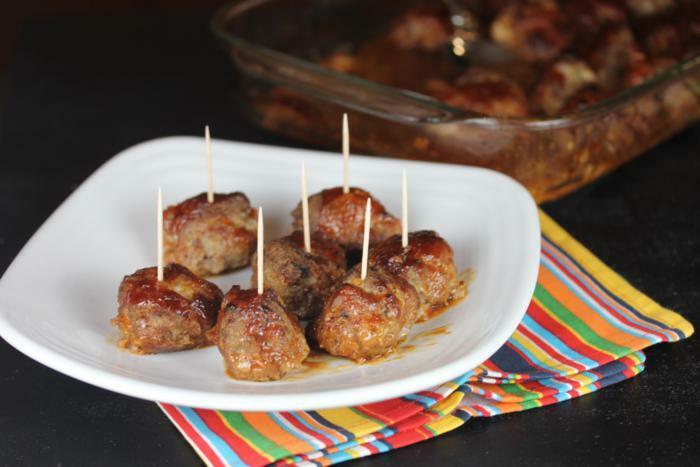 Place browned meatballs into a 9×13 pan. Pour bbq sauce over top of meatballs. Bake at 350 for 45-55 minutes. The time may vary depending on the size of the meatballs.